The Arrow II line of Antennas has been engineered to provide maximum gain and efficiency in the smallest practical size & weight. Only About 19 oz. (split boom add 1 oz.). The 2 Gamma Matches (shown above) are pre-assembled & pre-tuned. Bandit Stick Up PMR 78 70cms 430-450 Mhz Amateur Radio Portable Antenna PMR446. (You are buying the Hawkins-Radio Bandit "Stick uP" PMR78 7/8 wave Portable UHF 70cms PMR Antenna. th Wave) Dipole Length: 0.75m VSWR at Centre Frequency: 446.09375MHz (ch8)<1:1.05. Introducing the Bandit PMR78 “Stickup”. Model SRH805S. For BAOFENG. Band: Dual band VHF / UHF. 1Pc x Radio Antenna. For YAESU / Vertex. For LINTON. For PUXING. PX, PX, PX-2R, PX-V6. The Original Stinger. We are the original manufacturers of the Stinger and have been making this antenna in Birmingham since 1992. Known for it's flex i bil i ty and strength the Original Stinger will ensure years of use. Ideal for making RF leads Plug for standard RG8 or RG213 50 ohm cable . PL259 plug. PL259 plug. 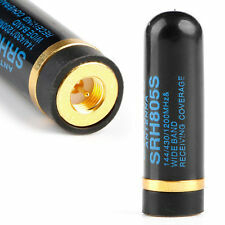 HF / VHF / UHF PLUG. Cable entry approx 9.5mm no reducer is supplied plug screws directly onto the cable. Walkie Talkie Type: Portable. Walkie Talkie Accessories: : Antenna. Walkie Talkie Type: : Portable Two Way Radio. Walkie Talkie Antenna: For Portable Radio. for BAOFENG: BF-888S,UV-5R ,UV-5RA, UV-5RC ,UV-5RE,UV-5R8W ,UV-5RE8W,UV-5RTP, UV-8HX,UV-82,UV-82HP,UV-82HX,UV-82 Plus, A-52(II),DM-5R Plus. Frequency Range: 136MHz-174MHz,400MHz-470MHz; Compatible with: Public Radio Scanner; Handheld HT Ham Radio, Two Way Radio, Walkie Talkie; VSWR: < 2.0; Impedance: 50 ohm; Antenna Mounting: NMO Mount Connector; Feature: Magnetic Base Mounting; Cable: 5m RG58/U Cable; Antenna Connector: BNC Male Connector. Total length: 75 cm / 29.5 ". Unstretched length: 15 cm / 6.0 ". Note: Light shooting and different displays may cause the color of the item in the picture a little different from the real thing. 300 Ohm / 1 KW. Transmit power: 1 KW. byflexible inner conductor (Copper-plated steel cord) prevents breakage with regular motion by the wind. The "window" to reduce the wind attack areas. with flexible inner conductor. (Applicable Model: YAESU: VX-1R VX-2R VX-3R VX-5R VX-6R VX-7R;TONGFA: TF-UV985 385 etc;BAOFENG: BF- UV3R UV100 U3 etc. 1 Magnet Antenna). Other radios suitable for SMA-M antenna. Size: antenna 38.5cm; line length 3M. If you are buying this to make your own Yagi or Directional antennas the dipole will fit a 1" Boom arm and has a 6mm stainless steel bolt and wing nut to attach it. 6m Band 50 - 52 Mhz. The SO239 socket will withstand high temperature and output powers as its manufactured from PTFE, unlike other cheap connectors on the market. Heavy Duty right angle mirror or roof rack bar mount 3/8 stud for CB aerial. This mount is the Stud Mount version and not with the snail mount so you CAN detach the cable if required. Heavy duty right angle mirror or ROOF RACK mount with aprox 4m cable. HB9CV antenna is the most popular directional antenna in the world. Connection: Direct connection to variable capacitor. VSWR: 1.5:1 or better. (Do you need a remote antenna switch?. Do it yourself! 1) 1pc of double sided trough plated PCB with the solder mask for the HF (short wave) 4:1 antenna switch. The power handling was tested with OM4000HF without any issue. For icom R20, AOR 8200, Kenwood TH-D74, YUPITERU MVT9000 or any other handheld HF Scanner Radio. 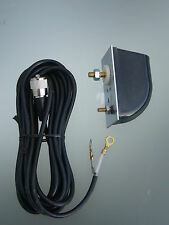 Active - Amplified HF - VHF Magnetic Loop Antenna with Customized Frequency Range. - 20 - 30 db gain over the already successful passive PL-250C Loop (20db on the higher frequencies of the. ). Our 1/2 wave or 'silver rod' as it is commonly known is probably the most popular CB base antenna on the market. It is 18ft long, has no radials, and is made from aluminum for excellent corrosion resistance. This is an End-Fed Half-Wave (EFHW ) antenna for 80/40/30/20/17/15/12 and 10m bands. Unlike many END FED antennas on the market, this one does not require the Antenna Tuner to operate. It is a resonant Half wave on 80m (3.5MHz) therefore also resonant on second, third and fourth harmonics etc. 33.4 feet overall length. 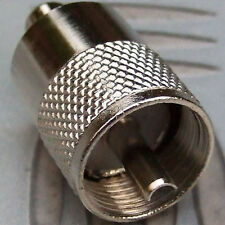 Coax fed, center connector accepts standard PL-259 plug. Constructed with 14 gauge stranded Copper Antenna Wire. Stainless steel & solid brass hardware will last for years! The Band Decoder is primary designed for Yaesu or Elecraft K3 radios with band output signal BCD coded. The Band Decoder provides source driver outputs, which provide a source of 12Vdc for the. The Automatic Band Decoder continuously decodes your transceiver's band changes and. Perfect For All Class Amateurs! 70 feet overall length. Perfect Match for your Antenna Tuner with Balanced Line Output. Works with All Transmitters, Transceivers, and Receivers. Shorteners are Sealed, Weatherproof, and Lightweight. For icom R20, AOR 8600, YAESU VR5000, Eton E1, Sony SW55. HF Magnetic Loop Antenna 3.5 - 40 MHz. or any other portable or table top HF Scanner Radio. - Excellent portability - made from foldable aluminum loop very convenient for traveling antenna. For SDR or icom, Yaesu, Kenwood, AOR Base Station Receiver. Low Noise Active HF Antenna 150 KHz 30 Mhz LF - MF - HF. Great Reception from Small Antenna. THIS IS A RECEIVE ONLY ANTENNA . - can be mounted on 3-5 cm Antenna Mast. (1) 1pc of double sided trough plated PCB with the solder mask for the HF (short wave). Do you need a remote antenna switch?. Do it yourself! The power handling was tested with OM4000HF without any issue. This antenna needs antenna TUNER to operate! · Most HF ham bands can be tuned by the tuner in your radio. NOTE: to tune all HF ham bands an external tuner may be required. Antenna Features ALL BAND HF ANTENNA. HAM DIPOLE ANTENNA - 40 Meters - NEW!! Spi-Ro Manufacturing MD-40 SHIPS FREE!! 66.3 feet overall length. Coax fed, center connector accepts standard PL-259 plug. Constructed with 14 gauge stranded Copper Antenna Wire. Stainless steel & solid brass hardware will last for years! Tecsun PL365 - PL360 and County Comm GP-5/SSB 200mm Long AM Band Ferrite Rod Antenna. - Transforms Your PL365, PL360 or GP-5/SSB Radio into a Very High Sensitivity and Performance Receiver for AM Band Dxing! This is an End-Fed Half-Wave (EFHW ) antenna for 80/40/30/20/17/15/12 and 10m bands. Unlike many END FED antennas on the market, this one does not require the Antenna Tuner to operate. It is a resonant Half wave on 80m (3.55MHz) therefore also resonant on second, third and fourth harmonics etc. Do you have high noise level on almost all MF and HF bands?. although designed to work with the MWA50 active HF antenna, It also works with other antennas to. 1 X Common Mode Choke for outside use. and you may need this to improve your reception. HF - VHF - UHF Antenna Duplexer for Kenwood TH-D74 F7 Alinco DJ-X11 and other HT Radios. with this duplexer you can use an HF receiving antenna to monitor HF bands and. ONLY THE ADS-74 ANTENNA DUPLEXER IS INCLUDED - NOTHING ELSE . SWR display resolution is. 01. Interface - any web-browser on Windows, Linux, iOS, Android. 200 - 1000 Watts. Power display is actual traditional Fwd power. This is a 200W version of popular EFHW-8010 End-Fed Half-Wave (EFHW ) antenna for 80/40/30/20/17/15/12 and 10m bands. Unlike many END FED antennas on the market, this one does not require the Antenna Tuner to operate. Material: Chromium, Copper. With retractable 4 sections, this portable FM antenna can be shortened or extended. This 360° rotatable antenna is convenient to set to a certain angle when it is mounted on your FM radios. Preamp for RX antenna like DHDL, FLAG, PENNANT, Double Flag, TX3A, FO0AAA. Only for 1-4 MHz (Band pass filter 1-4Mhz). Power feed unit has TX/RX switching for protect preamp during transmitting. 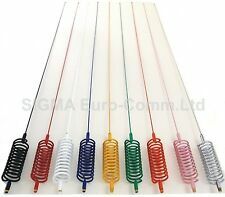 - 22 or 66 m wire for Loop antenna (Flag or Double Flag).